I’m down with a cold this week, one of those irritating ones that leave you bleary-eyed and itchy-nosed. Happens every year as the weather changes! I’m doing a quickie post this time around as a result. 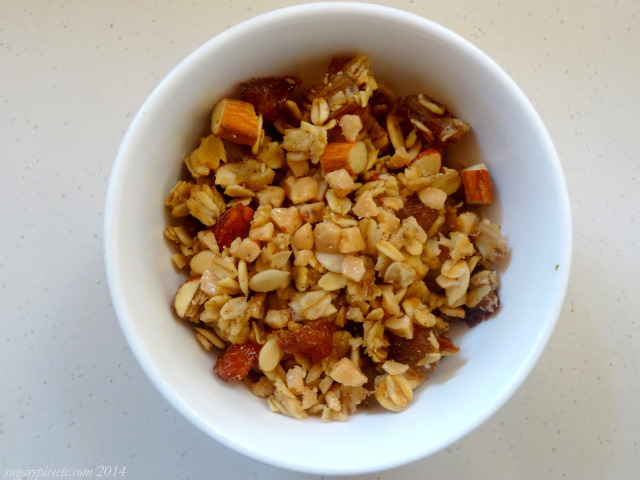 Recipe redux: granola, with a little twist. I added toffee chips! ‘Tis the season for toffee nut lattes, and it’s also the season to toffee up your granola. A little indulgent? Yes. Delicious? You bet. It’s easy to make and the only extras you need are butterscotch or toffee chips. I used Heath Toffee Bits, which are crunchier than Nestle Tollhouse Butterscotch morsels.